Red rocks feature prominently in place names of Southwest USA - New Mexico, Arizona and California each have a Red Rock State Park and there are several similarly named towns in these and other states. 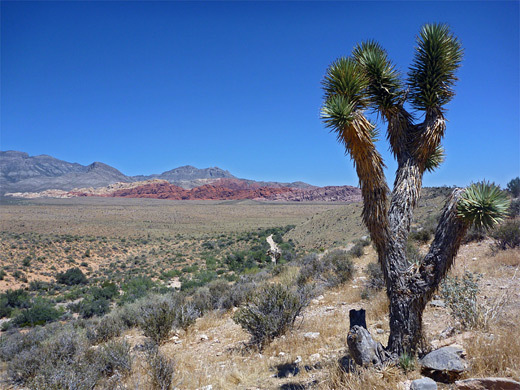 Nevada has at least three Red Rock Canyons; two are in sections of the Toiyabe National Forest near the center of the state but by far the most well-known is location is along the east side of the Spring Mountains - one of the ranges of hills that surround Las Vegas in most directions. Just five miles from the edge of the city, the flat land rises to a great colorful escarpment, formed along a fault zone (the Keystone Thrust) with peaks over 8,000 feet, and including huge cliffs and ravines composed of bands of grey, white and red sandstone, all heavily eroded. 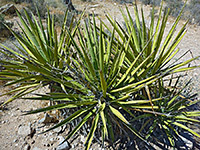 The wide empty plains beneath the hills are studded with Joshua trees and other plants typical of the Mojave Desert, contributing to a most impressive spectacle. The canyon is the largest of a dozen or more major ravines along the highest and most colorful section of the cliffs, which forms the most well-known part of Red Rock Canyon National Conservation Area. Facilities, including trailheads, overlooks, a visitor center and a scenic loop road are concentrated in an eight mile-long region towards the south end of the preserve, though the whole area is much more extensive, stretching over 40 miles; from the foothills of Mt Charleston around Hwy 156 in the north, to the remote Bird Spring Range in the south. The nearest town with hotels close to Red Rock Canyon NCA is of course Las Vegas - several hotels on the west side of the city are an easy 15 minute drive from the park boundary. The developed section of the National Conservation Area is easily reached, as one of the busiest east-west routes through the center of the city leads directly to the park entrance - this is Charleston Boulevard, which crosses Las Vegas Boulevard (The Strip) a few blocks beyond Stratosphere, northernmost of the large casinos. The look-alike suburbia extends for a long way, as the road passes miles of seemingly identical shops and houses, and finally a number of large, luxurious walled estates. 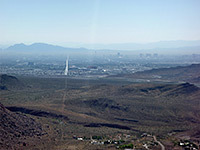 More of these are under construction and the most recent development is now just a few miles from the mountains - properties here are highly desirable and enjoy sweeping views in both directions, since the whole city of Las Vegas is spread out to the east, and the cliffs and canyons are visible to the west. The park entrance is 15 miles from the Strip via Charleston Blvd, though the 20 mile alternative route along US 95 and the Summerlin Parkway might be quicker, since this has no traffic lights. After being dead straight for 13 miles, Charleston Boulevard bends to the left, becomes Blue Diamond Road (State Route 159) and climbs into the foothills. It follows alongside the cliffs for a few miles while heading south, then curves back east towards the city. 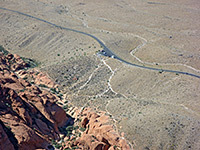 One elevated viewpoint (Red Rock Overlook) affords the best overall view of the cliffs, while for closer access there is the paved, 13 mile, one-way scenic drive (open from dawn to dusk, north to south), within the National Conservation Area boundaries. 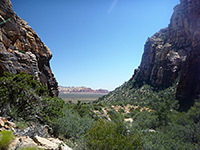 The area is administered by the BLM, although as with all other NCA sites, the National Park Service 'America the Beautiful Pass' is valid, and a yearly pass is also available ($30). The standard entry fee (2019) is $15 per vehicle. The park has a good visitor center, plus a museum, book store and gift shop. Backcountry camping is permitted for areas above 5,000 feet elevation (approximately 200 to 700 feet above the scenic drive), and there is one developed campsite, along a short side road forking south off Blue Diamond Road 2 miles east of the visitor center. This is open all year except from June to August when the weather is considered too hot for camping. Points of interest in Red Rock Canyon NCA include narrow canyons, seasonal waterfalls, petroglyphs and pictographs, while besides sight-seeing, the park is popular for hiking, rock climbing, canyoneering and mountain biking. ATVs are not allowed. Apart from the usual Southwestern creatures, wildlife in the area includes herds of wild burros, descendants of animals used by miners early last century. This is just a selection; the park has about two dozen overlooks and trails. - the hills are a large outcrop of eroded red Aztec sandstone, excellent for climbing. There are several overlooks, and trails for the more energetic. 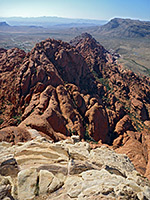 The top of the ridge - reachable by careful off trail scrambling - has good views over the colorful Calico Basin at the far side, and of all Las Vegas to the east - as ever the distinctive shapes of the casinos are clearly recognizable; see 360 degree panorama. Calico Tanks - the tanks (also known as tinajas) are natural cavities in the Aztec sandstone which hold water for some time after rainfall; they may be reached by a 1.2 mile trail starting at the parking lot at the north end of the Calico Hills. 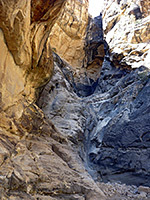 Icebox Canyon - Icebox is one of many narrow canyons that drain the mountain slopes. A path leads up the drainage for about a mile, though more can be seen by scrambling off-trail, over boulders and up small dryfalls. La Madre Spring - this is found in a ravine at the base of La Madre Mountain; a fairly easy, 1.8 mile path leads to the waters, starting from the end of the spur road to Willow Spring picnic area. - this is the largest canyon through the cliffs, and it provides the only through route to the west side of the Spring Mountains. A 20 mile dirt track (requires 4WD) follows the streamway past more of the characteristic colorful, layered rocks, then across the western foothills to the desert town of Pahrump. Pine Creek Canyon - this pleasant canyon features a permanent stream, large shady trees and the remains of an old homestead, all accessed by an easy, 2.5 mile loop trail. Spring Mountain Ranch - historic ranch dating from 1876, adjoining pasture, woodland and a lake; managed by the Nevada Division of State Parks. - a narrow, sheltered ravine containing a short trail that follows alongside the creek bed to the base of a (seasonal) 30 foot waterfall, Spring Canyon is dry during summer although the creek does flow year round in one short section, where the waters rise up in a narrow, overgrown channel, trickle down the hillside for several yards then sink below ground again.